Imagine you had a radio show. What would you say? Deadline​ - Entries to Post 2667 closed October 31st for 2018-19. Check back in the Spring of 2019 for next year's program. VFW believes strongly in good citizenship and fostering patriotism. That’s why we encourage youthful minds to examine our nation’s history and their own experiences in modern American society through our Voice of Democracy youth audio essay contest. The national first-place winner receives a $30,000 scholarship paid directly to the recipient’s American university, college or vocational/technical school. 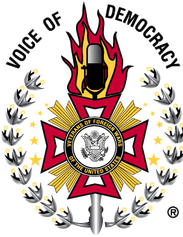 A complete list of other national scholarships range from $1,000-$16,000, and the first-place winner from each VFW Department (state) wins a minimum scholarship of $1,000 and an all-expense-paid trip to Washington, D.C. Want to apply? Read the rules and eligibility requirements and download the entry form before you submit your entry at your local VFW Post. So imagine you've got radio time and you are about tell all of your listeners Why My Vote Matters.